Green Minds is an organization specialized in creating sustainable life education for the next generation. We have carefully created our program keeping in mind today’s intelligent children and demanding parents. Our program enables the child to synergize and perform in harmony. 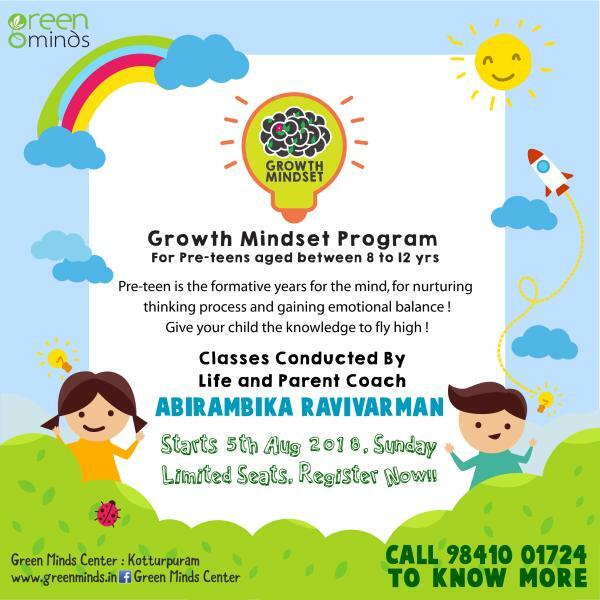 Green Minds ‘Growth Mindset for Pre-Teens’ guides the child to understand and be aware of Nature’s Infinitude of Body, Mind and Self. Concentration problems usually lead to bad emotions irrespective of child or adult. Our growth mindset program will help children to concentrate and find creative solutions to problems while making decisions. This program will give the child a clear vision on positive growth and achieving goals. Children have a variety of things to do and learn, being mindful will enhance their capacity to stay focused. Our program will initiate the children into the awareness of the power of their mind. With this understanding and application, their performance will accelerate. Our program covers a wide range of topics like social skills, self-disciple and self-control, self-esteem, confidence, mindfulness, emotional regulation (anger, fear and anxiety), gratitude, communication and much more. The program is curated and will be conducted by Life & Parent Coach, Abirambika Ravivarman along with author/blogger Anupama Vijayakumar and Speaker/Spiritual Coach Jayalakshmi Sakthivelan.